Actor Keifer Sutherland outside of the 1st Precinct Police Station in Manhattan. Kiefer Sutherland was arrested Thursday afternoon on a misdemeanor assault charge for headbutting a fashion designer who had allegedly bumped into pal Brooke Shields at a swanky Manhattan party. More than 100 photographers snapped photos as an emotionless Sutherland stepped out of a black towncar and walked into the First Precinct in Tribeca flanked by an attorney and a police officer. He made no remarks and showed no expression. The actor was arrested and slapped with a third-degree assault charge, a misdemeanor, which carries only a desk appearance ticket. He won't have to go to jail and he'll be free to travel pending his arraignment. The source of his anger, Proenza Schouler designer Jack McCollough, only sustained minor injuries after the headbutt. 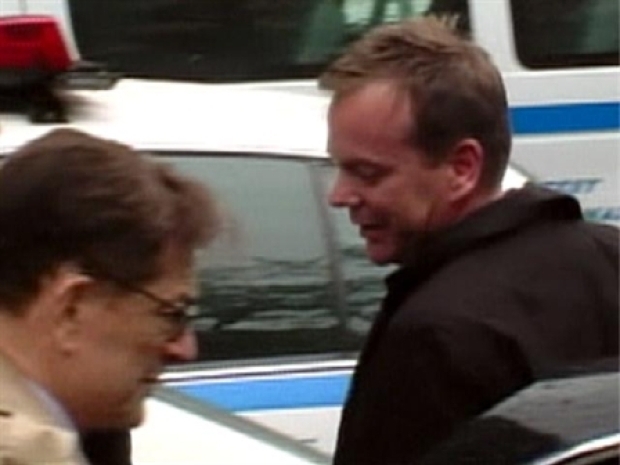 Kiefer Sutherland leaves an NYPD station house in Tribeca after being charged with third degree assault. This is yet another drunken legal hassle for Sutherland, who served 48 days in jail on a drunken driving charge in California last year. The "24" star seemed to have been channeling Jack Bauer, his terrorist-fighting alter ego, when he roughed up McCollough Monday night at the Met’s Costume Institute Gala. Sutherland and McCollough allegedly got into the tiff at an after-party at the club SubMercer. Stars like Kirsten Dunst looked on as the two roughed it up, according to theDaily News. Kiefer Sutherland arrives at a New York City police station for questioning about a fashion designer's claim that the actor head-butted him at party Tuesday night. Early reports said the TV hero slammed his head into McCollough's, shattering his nose and landing McCollough in the hospital, but according to police McCollough’s only injury was a small cut on his nose. Sutherland, 42, was reportedly upset that the designer bumped into long-time friend Brooke Shields, 43, though it was unclear why he attacked McCollough. A police source quoted McCollough as saying the dustup "wasn't even over anything . . . he was just roiling drunk and looking for something to smack. It didn't matter what." Shields is not happy about the chivalry. Her reps have said that McCollough did nothing to deserve the brutal treatment even though she was bumped into. The actress is expected to talk to cops about the case. A source close to Sutherland said the fight is not surprising. “When Kiefer gets drunk he gets belligerent” the source told the News. “If he was drunk, none of this surprises me. He sticks to water in public but in private he goes right to the booze and gets angry and violent. When he's drunk, people are afraid to be around him." A friend of Kiefer's told the Daily News that the actor is sorry for what he did, but maintained that McCollough provoked him by not apologizing to Shields when he bumped into her. McCullough's people said he's not the type to provoke anyone. Sutherland has a history of alcohol getting him into trouble. He has been arrested twice for misdemeanor drunken-driving, once in 2004 and again in 2007. In 2007 he served 48 days in jail.